OPEN HOUSE - Sunday, April 28, 1-3 -- Serenity and space is what this home is all about! 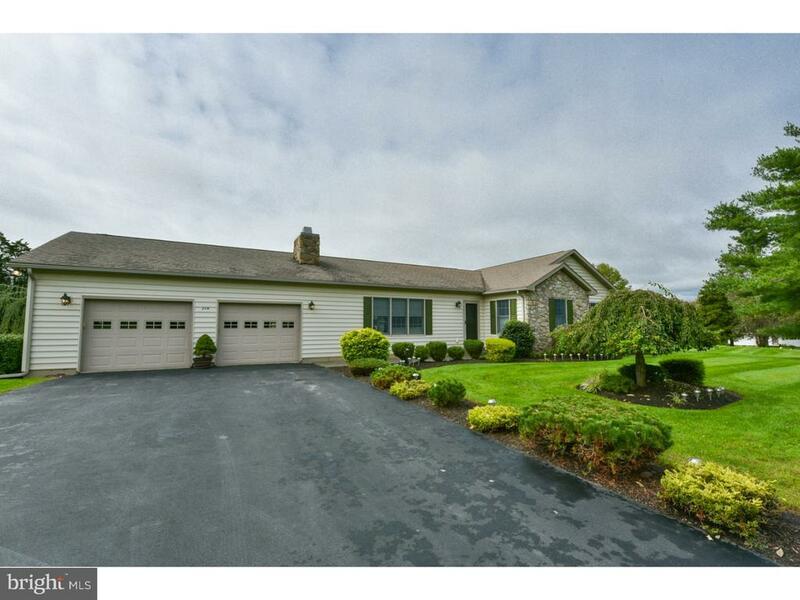 Neatly tucked in the farmland of Bedminster Township, and just 9 miles from Doylestown Hospital, this beautiful ranch is a home for generations to come! Professionally manicured lawns and landscape welcome you to this retreat! Enter into the Great Room and feel the space with the cathedral ceiling. The open floor concept joins the living area with the floor to ceiling stone, wood-burning fireplace to anchor the comfortable space. The grand eat-at island is ideal for large buffets or just feeding the little ones. The generous amounts of custom shaker cabinetry and stainless steel appliances will make your friends envious! The dining area can host your holiday gatherings or intimate nightly dinners, while overlooking the deck. Hardwood floors throughout tie everything together! Glide down the hall to the master bedroom, with sliders to the back deck and on-suite master bathroom. Two sinks make for a happy life! The walk-in closet will accommodate all your belongings! The hall bath with custom tile and transit window light makes tub baths easier! Two more additional bedrooms with custom bottom-up window shades finish out the sleeping quarters. Main level laundry makes for easier living! Need more space? The finished basement sets the stage for a rec room, or toy/teen room. The wood shop is ready for the best craftsmen with Bilco door entryway. Theres even more storage in the unfinished area! The oversized 2 car garage has additional rack storage. The back deck opens to a gated area to keep the little ones or pets safe. As an added bonus, the large shed has electric! Enjoy the large and level backyard, with enough space for a swingset or even a pool! This home boasts a propane-powdered generator with new transfer panel 2016 servicing 7 areas, New water heater 2018, Newer septic system 2015, insulated basement, UV light protected and reverse osmosis water filtration system, interior vac-system, whole house ground, newer hardwood, and fresh paint, reassuring you this is a well maintained, quality home. Its all done and just needs you to move in! Conveniently located within minutes of shopping and restaurants, and major routes, its a quick trip to historic Doylestown. A must see to truly appreciate! Green Remarks: Ceiling fans, energy efficient appliances. Directions: South on 611. Right on Deep Run. Right on Wood. House is on the left.